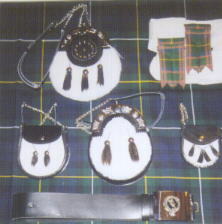 Sporrans are worn with Scottish, Highland and Irish kilted attire. The sporran is essentially an ornamented carry-all bag. The modern sporran has been relocated to hang in front whereas it was once attached to the waist belt and used to carry all sorts of items, including the days rations (oatmeal cakes). To-day it is more likely to carry the pipers spare bagpipe reeds, money, car keys, a wee flask of Uisge, handkerchief and other incidentals. At a wedding the grooms bestman will find his sporran ideal for holding the wedding ring(s), and speech notes. Sporrans can be decorated with clan crests, and Celtic or Pictish patterns may either tooled into the leather or fitted as attachments. 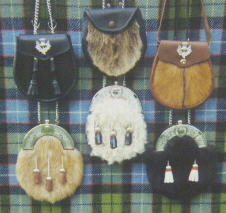 Different skins, leathers and tassels furbish the sporran to personal tastes. Our sporrans are hand crafted from leather and skins. The skins are obtained from culled farm livestock and through hunting (see note below*). In general we hunt, prepare and cure all skins used. These are rabbit, possum, goats (feral and farming culls (Saanen, Angora)) and cull calves or cattle. Often some shades of hair or fur are not readily available at any given time. Each sporran may follow a pattern but is generally unique, therefore those shown are only a guide. The making of Sporrans that are exactly the same would be unlikely. Even if requested the only guarantee is that it could be close, not identical. 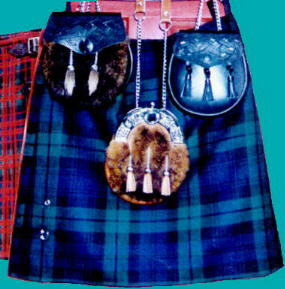 The modern "bum-bag" worn at the waist (especially by tourists etc..) is the modern equivalent of the original sporran. Modern versions of traditional sporrans can be made in a variety of designs and materials. MKH manufacture a sporran cantle suitable for semi-dress and dress sporrans. Hunting note: The feral animals hunted are classed as vermin by the authorities because they endanger the native NZ bush and forest. The NZ bush evolved without browsing or predatory animals such as mammals or marsupials. (Though various species of Moa were browsing birds.) As there are no natural predators to contain the feral animal populations, hunting and poison drops are seen as the only viable controls. It appears some administrators in the government authorities, with support from elements of NZ Bird & Forest Society and have a fixation on total extermination and the use of poison (1080). Many groups oppose this. Some environmental groups and sections of Government (including local bodies) continue to approve the use of poison although it is known to adversely affect other wildlife indiscriminately. The NZ Deerstalkers Assn opposes the use of 1080 poison, and the policy of extermination. Species introduced into NZ include: feral Goats, wild Pigs, Deer (red, sika, fallow, rusa, wapiti, samba), Chamois, Thar, Possums, Wallabies, Rabbits, Hares, Weasels, Stoats (ermine), Ferrets (fitch), feral Cats and horses, cattle and sheep. Some of these are now farmed and form part of the everyday NZ farming scene. Others, once farmed, have escaped (and even been released by irresponsible people) into the wild.